We love our work at RB SAILS. And much of our work is nothing to do with sails! 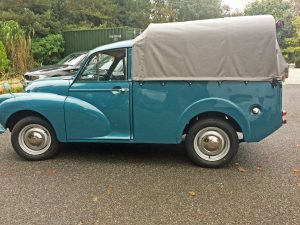 Working on this lovely classic Morris Minor pick up to make a cover to the customers bespoke requirements was such a pleasure. 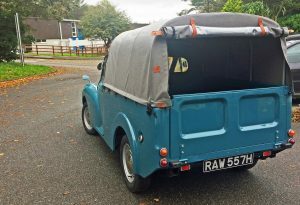 We have the facilities to keep the vehicle inside while we do all the fabric work including measuring up, patterns and manufacturing and fitting the cover. 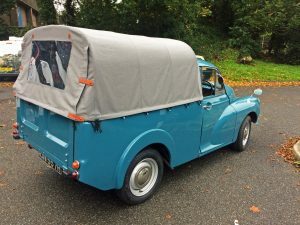 The Customer chose this nice shade of grey which goes really well with the Morris Minor blue. At the back we added a clearview PVC window with zips (not original but a nice improvement) and leather straps so it can be rolled up and down. 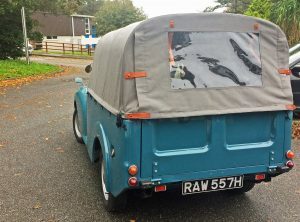 If you have any custom covers or vehicle cover requirements then contact us on 01736 754659.